Made from sturdy handmade batik cloth, pattern designed by Penduka artists. 100% cotton, machine-washable. Available in warm grey, navy blue and turquois on off-white base cloth. Made from sturdy handmade batik cloth, pattern designed by the Penduka artists from the slums of Katutura district, Windhoek. 'Let's get busy' is one of our most successful batik pattern with a Penduka artist working about 1 day for a full table length is 7 meters. Table runner machine-sewn. 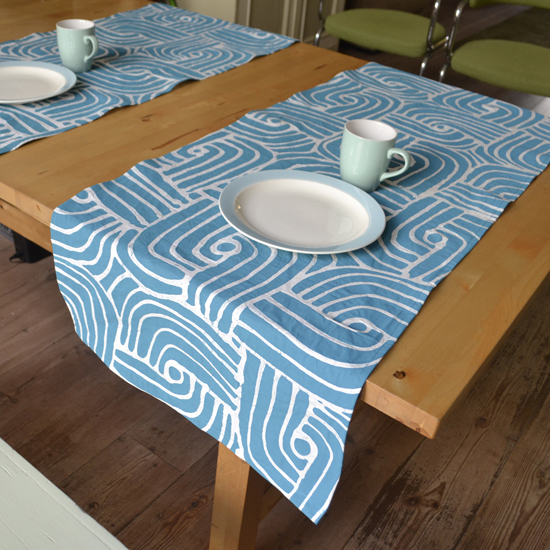 Available in warm grey, navy blue and turquois on off-white base cloth. Size 150cm x 50cm. Durable material, 100% cotton, machine-washable. For other specific colour/ size variants or personalised motifs please contact us.